Discussion in 'TSLA Investor Discussions' started by Crowded Mind, Mar 27, 2016. How many total deliveries will Tesla have in Q1 2016? Please post your precise prediction for total Q1 deliveries. Feel free to specify X and S, but winner will be determined based on total. In the poll, please indicate the range that your guess falls within. Guess can be adjusted anytime before Tesla announces deliveries, and the poll will close after market close on 3/31. 15,723 total for Q1 2016. The split will be ~13,000 Model S and ~2723 for the Model X. That being said I don't think Tesla will give a break down. It seems that the X ramp is going well enough that coupled with the report of better deliveries in China we should see them meet guidance. I don't see them exceeding by much and would not be surprised by a miss. So I will say 16,025. 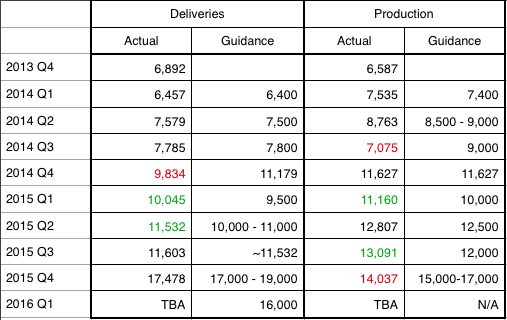 My estimate for Q1 deliveries is 16,300. If you had asked me two weeks ago, I would have said 15,500. Hmm, much less interest this time around than quarters past. I think it has been a pretty quiet quarter and things appear to be going smoothly, which is a great thing. I'll estimate 16,450. 20k+ in Q2 seems very achievable which should put them in a good place to hit at least 80k for the year. Delivery numbers "event" is badly overshadowed by the 3 release. At the Fremont factory they had a big tent set up for all the deliveries today (end of quarter). The highest VIN for an X was 5101 but most of them were in the 19xxx range. My guess is a total close to 18,000 of which at lease 2,700 are Model X. I predicted on the TM forum that X deliveries would be at least 2,560, which turns out to be a little less than actual. 6300 model S, 2720 X. Europe could be 3700 model S, but that's already generous. That leaves 3300 deliveries needed in China and elsewhere for a delivery beat. I am hoping for more US deliveries because otherwise it's going to be hard. 3700 S for China is not achievable I think. 3000 would be even a little too optimistic I think. I'm not aware the usual numbers in Hongkong, Oz, and Japan. OTOH. It was recently reported that China sales are up 400% y-o-y. Last year they delivered 800 cars there in Q1 so it might just be possible. Remember that they reiterated guidance for this quarter half way through. They must have had very good visibility back then already. There were also reports on the last few days (I think it was right after the 400% news), over one hundred S were delivered in multiple stores each. I'm not sure if those were included in the 400% or not though (information discrepancy and what not). Regarding to guidance, I think sales in China is picking up. Last late Sep Beijing finally recognized Tesla as alternative energy cars and granted future owners some perks in obtaining licence plates. The lottery system of obtaining a licence plate for an ICE car normally takes 3-5 years, I have a friend is still testing his luck after 10 years. But for alternative energy cars, 0 time waiting. This is having a positive impact on orders placed Q4 2015 and exhibiting in deliveries Q1 2016. I think this effect can last. Also there was a discount for about 5% if you trade-in your ICE car going on for 45 days in late 2015 so those orders definitely helped Q1 deliveries. But this effect can't be maintained. With InsideEVs estimating 6300 S 2720 X, Europe estimated 3100 S (EU Market Situation and Outlook), that leaves 3880 to the rest. China is bearing the largest burden of this. Meeting guidance looks dicey, as it ever has been. My WAG is just under 17k. My reasoning is that if the numbers were bad, they would have released them after hours on Friday while letting reservation excitement continue to overshadow it. Meanwhile, releasing on Sunday--after Elon's last reservation update until mid-week--may mean they want that number at the forefront of people's minds come Monday opening. They're definitely also still doing end of quarter pushing, lot of evidence in the MX forum (cold calls to move up production/delivery for people) and still having delivery attempts on M3 reservation day. I think it could be close to 16K, but that Europe estimate seems low to me. If you look at March delivery numbers for those European countries that have already reported, they are between 3-5 times higher than the average delivery for the same countries during Jan-Feb. So even taking the low end as a guide would bring us to 3300 once the deliveries from the remaining countries are in. The next quarter is already underway, so in order to achieve close to 1k Model X per week, they need to be delivering as many, because where would they put them... All in all a positive thought since I hope to get mine soon.